Although the Bos’n Bill feature had appeared in Canadian Heroes from the beginning, the Bos’n Bill Club was not introduced till Canadian Heroes, 3-2, January 1944. Members received their ‘papers” and a sweater crest plus a colour picture of a Canadian fighting ship. “Watch for Bos’n Bill’s Treasure Chest.” Car., Canadian Heroes, 3-4, March 1944: 14. 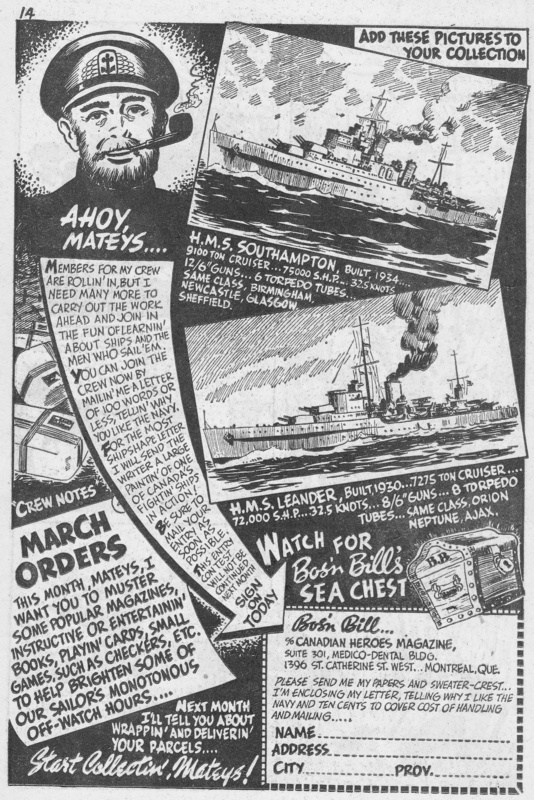 “Join Bos’n Bill’s Crew.” Canadian Heroes, 3-5, April 1944: 52. “Bos’n Bill’s Seamen.” Canadian Heroes, 4-6, January 1945: 63. “Navy Contest No. 1: What’s Wrong With This Corvette.” Canadian Heroes, 4-2, July 1944: 12. 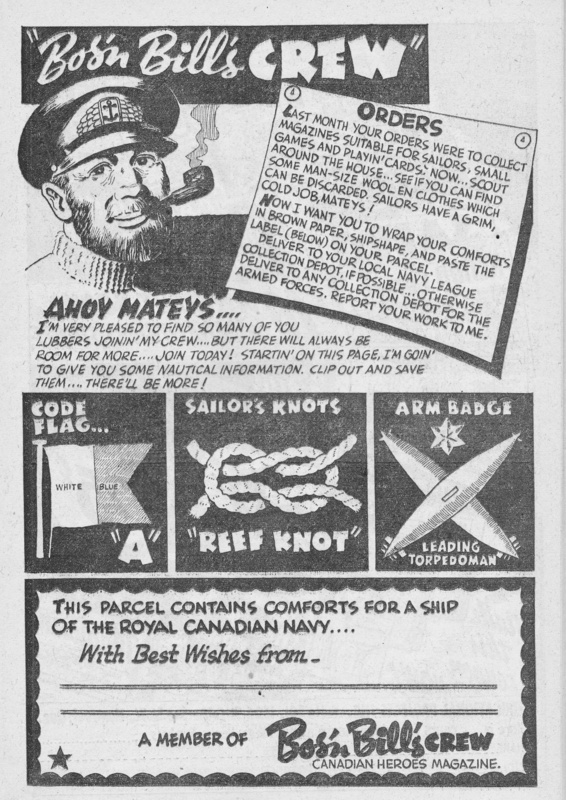 “Promoted To Full First Mates.” Canadian Heroes, 4-6, January 1945: 64. Print. “Bos’n Bill’s Crew.” Canadian Heroes, 4-1, June 1944: 38-39. “Watch For It! The Bos’n Bill Club in the January Issue.” Canadian Heroes, 3-1, Nov./Dec. 1943: Inside back cover. Canadian Heroes, 3-4, March 1944: 14. Canadian Heroes, 3-6, May 1944: 31.